Got questions about your Infiniti? We're here to help, and it's FREE! I have a 93 infiniti J30 and when I start it up in the morning it runs fine for about 10 to 20 minutes, when the engine gets heated up. Once the car is warmed up however, it won't rev past 3000 rpm in any gear, and has no power. It misses and surges, the rpms jumping from 2200 to 2600 to 2400 to 2800 and so on even when the gas pedal is pushed to the floor. It idles just fine though, and it runs ok when i press pedal lightly (around 1500 to 2000 rpm) but messes up as soon as it hits 2000 rpm. I have checked to see if the catalytic converters were backed up, replaced the mass air flow sensor and ignition control module, and none of this was the problem. There is no check engine light on, even when I unplug some of the sensors. I know that the ECU is only OBD1, but shouldn't the check engine light still come on anyway? Right now I have some theories as to what the problem could be. The fuel pump? but why would it start acting up after the cars been running for 10 to 20 minutes? Wouldn't that cause the problem immediately? I don't know what the fuel psi is supposed to be on this car, and if someone could tell me that would be much appreciated. Another theory is the alternator is overcharging the battery, which in turn could be affecting the way the sesors read. I have no voltage meter so i can't test it. My last theory (and the one i'm leaning most towards) is that the Crank Angle Sensor is going bad, giving the ECU a bad read. I took it off and the shaft binds and is hard to turn, so I'm going to replace it. Also, I have a timing light, and I know I'm supposed to reset the CAS at 15 degrees before TDC, but I don't know how to use it. Please tell me how to do so. Well this is all I can think of, if you think of anything better, then reply to this post. Thanks for your time. Re: Help!!! 93 Infiniti J30 runs horribly after warming up! Voltage meters are dirt cheap at www.harborfreight.com - not the best available, but better than nothing. I tend to agree that the CAS is a likely culprit. Might be worth checking the electrical connections to make sure there's no corrosion and that they're tight. Thanks, man. Your the first to reply. Now the car won't start at all though. It does get fuel and spark, which leads me to a timing problem. And since the timing belt is tight and all the dots line up, I think the CAS is to blame. I know if it is bad the car won't run, so I'm going to buy it and see what happens. I'll let you know how it goes. But do you know how to use a timing light so I can set it at 15 deg before TDC? You can get it pretty close by reinstalling the new one in the exact same position as the old one. Honestly I've never used a timing light... There should be a wire somewhere you can clip one of the leads to and then shine it on the crank pulley and line it up with the correct timing mark. Maybe the FSM explains it? OK... check out EF&EC-31 and the next few pages after that. Thanks, replaced the TPS, thats not the problem. Bought the CAS but it won't get shipped in until Tuesday. That part is over 200 dollars. I can put the new one in the exact same position as the old one because before I took it off I outlined where it goes in marker. The manual FSM doesn't open when I click the links. I don't know why. Still looking for what the Fuel pressure is supposed to be for this car. Found out that the fuel pressure is supposed to be between 34-43 psi. At idle (800 rpm) its supposed to be at 40 psi. Also the TPS is supposed to be adjusted to .488 volts. How do I adjust the TPS to where I can increase the voltage? Do I just tilt it up or down? Going to replace the CAS Tuesday. Can't wait!!! Do you have Acrobat Reader on your computer? If not you can download it here. You need it to open the service manual. Yeah but I have dial up internet so that's probably why it won't open. Hey do you know where to put windshield washer fluid in my car??? I've looked all over and can't figure it out. The only canisters under the hood I see are for break fluid and engine coolant. Dial-up would be a problem - those files are pretty large. The washer fluid tank cap is near the right headlight and is about the diameter of a half dollar. On the passenger side? It has a yellow cap and says engine coolant only. And a little farther back is the power steering canister. Is that the one? mjgrosso93 wrote: On the passenger side? It has a yellow cap and says engine coolant only. And a little farther back is the power steering canister. Is that the one? No it's forward of all of that. You're not going to see the canister, just the cap for the tank sticking up through the plastic cladding that spans between the bumper and the radiator. If you have your owner's manual it'll show you a picture in there. I can link you to the owner's manual on Infiniti's site, but I think we'd be in the same situation as with the service manuals. Found It!!! You see when I bought my car it was wrecked in the front, and the radiator and bumper were pushed back a little. Not major, but enough to break the top off the windshield wiper canister, which is probably why I didn't notice it right away. I'm going to have to buy a new one. I get the CAS later today so I'll tell you how it goes. I took off the fuel filter and found that it was all clogged up, so I connected the fuel line directly to the fuel rail and still nothing. My fuel pump works and gets adequate voltage. (I tested it with my new Voltage Meter) I'm going to get my fuel pressure tested later too. I bought the camshaft position sensor and put it on, but the clip broke and I took it off. For some reason I didn't check to see which order the wires went in before I did so. Can you help me??? There is a solid black, black and white, green and black, and a green in yellow!! I need to know what order they go in top to bottom!!! Those color codes are shown in the factory service manual for the '94 (earliest year available) on page EF&EC-84. What I can't tell from the diagram is if they're refering to the connector looking into it at the pins, or looking at the back of it. So the order is either: Black, Black/White, Green/Yellow, Green/Black OR Green/Black, Green/Yellow, Black/White, Black. I just sent a PM to one of our other moderators who owns a '94 J30, so maybe he can look and post here so you'll know for sure. That sounds just about as confusing here as the in the J forum. If the weather breaks tomorrow I'd be more than happy to snap a picture, and upload it, but I have a 95. The old service manuals are not for very easy to understand especially when it comes to repairing electrical connectors. How did you break the connector and what are you planning on doing to fix it? mjgrosso93 wrote: I have a 93 infiniti J30 and when I start it up in the morning it runs fine for about 10 to 20 minutes, when the engine gets heated up. Ouch, a lot of guess work, and time, money and effort spent. Might be a good idea to pull codes, even though the CEL isn't ON, especially if you haven't been able to make it turn ON by disconnecting some items. There's plenty of camshaft torque to turn the CAS, so the worst that a dry/binding sealed bearing might do is make some noise and come apart someday. I actually tore my CAS apart to replace the bearings, and in the process bent the rotating laser cut wheel inside. Fortunately I was able to flatten it enough to the gap of the pick-up. eBayed a $20 CAS from a Z32, but guess what, the connectors are different. And now I have the tools and know how to pull them apart and press things together again without bending things inside. Think simple, focusing on ECM inputs that change as the engine warms up, such as coolant temperature and air sources. Verify the engine timing. Locate/clean the timing marks, connect power to the timing light from the battery, test the light, connect the pick-up to the #1 spark wire, start the engine (all wires clear!) and point the light at the timing marks (with the engine running and watching out for all moving parts!). Print these instructions out and read through them too. How many miles on the engine? What is the engine (fully warmed up) idle speed, with the car in drive and stopped with your foot on the brake? MAF is clean/good, air filter is new, no vacuum leaks? Thanks for posting Steve & Gerry!!! its 3am here in GA but i got nothing to do so ill go look at my 94 and see what i can do for you. i had a similar problem where motor wouldnt crank cause my CAS had come slightly unplugged when i took the driver side timing belt cover off to check something. be back in a bit with some pics and stuff for you. ok here is a pic of the cas connector. wires top to bottom are black, black/white, green/yellow, green/black. to check timing with timing light. aim it at this plate on the motor. you may need to clean it to see the numbers and markings. there is a marking on the crank pulley itself and when the timing light flashes you should be able to see where it lines up. reason im beginning to think of coolant temp sensor for ecu is because i had a similar issue as well after i heat soaked my car after waiting to get my car dynoed. when i left the car was sluggish below 3k but i didnt have the issue where it wouldnt rev past 3000rpm. when i got home i check ecu codes and had a code 13 for engine coolant temp. when you check ecu manually you may also have a code 11 for the CAS itself. i didnt have a check engine light for either of these. 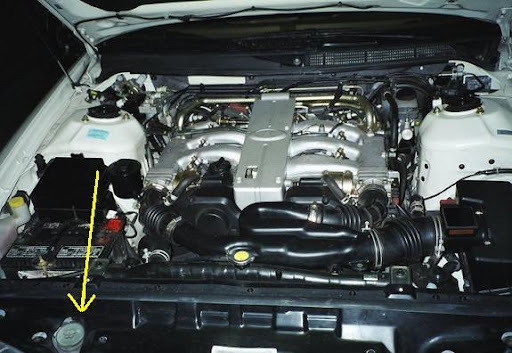 the coolant temp sensors are located on the hard pipes as shown below. check the connection here and clean it up if it looks corrosive. for tps you loosen the 2 bolts that hold it in place to rotate it up or down to adjust the voltage. check out this document first though that gerryo posted up a little while ago. just post any more questions or let me know if there is something ive over looked. if you can get access to the FSM, let me know what info you need to get from it and i can take screen shots of those pages and put them up. another thing im thinking it could be is the det sensor could have gone bad. i know for a fact that once that goes bad, it will put the ECU into a safety map which throws a lot of fuel at the motor to keep from detonation. this doesnt necessarily mean that the car has detonated, these sensors just go bad after so many years. a temporary fix you can try as well thats relatively cheap is to stick a 1megaohm resistor into the plug for the det sensor. you can get them at radioshack for $1.99 for 5 i believe. on my car ive deleted quite a few things and some of it i dont recommend for those that arent too car savvy but this trick will help you determine what your other problem is. the pic below shows how i permanently soldered a resistor in line with the harness. it this does end up being a part of the problem, id wait until you have a lot of time to be able to get under both plenums and replace it. the sensor is the cheap part, removing all the pieces of the car to get to it is a PITA. for a first time plenum pull it will take you a few hours. there are a few things id recommend deleting that are no biggie that makes it a little easier to pull off and on. if it comes to this point i can give you a small parts list of stuff to get to pull the plenums. here is a doc about doing plenum pull and bypassing the throttle body coolant system <=which i highly recommend, it doesnt hurt anything. I'm going to put the new sensor on on sunday, and I'll let you know then. Thanks for telling me the order of the wires greatly appreciate that!!!! If my car runs after this I'll go get the codes pulled too. I'll talk to you on sunday evening. turn the key to on. then died about 3 seconds later because their was no power to the fuel pump. I"m not sure if the original problem still exists because it only ran that brief period. Do you think my ignition switch is bad? I think so. How do you replace that? I'm going to go start the car in a minute and let it run for a while and see if it still surges like before, and then kill the motor by disconnecting the fuse to the fuel pump again. Car starts but same problem as before. Going to buy the coolant sensor and I have a hunch that its my Tps going to buy that too. Also ignition switch. Going to buy these parts tommorow. Also smoke comes from the passenger side on the motor, seemingly the manifold. I checked for oil in the coolant, and if it was overheating, both were fine. It smelled like a burning wire.... I don't know maybe oil. Anyway I don't like it. Please tell me what you think guys, It'll take a few days for get the parts to get shipped in, I'll update you then. Sounds like you are having the exact same issue I am having on my car as well. When I go to turn off my car the motor will continue running and the dash lights stay on but radio and all other electronics stop working. I think this is because of a bad ecu. When you turn off the car and pull the keys out, go under the hood and pull the ENG CONT fuse and the car will shut off. Look up under the plenum to where the valve cover is at. It could be leaking slightly and dripping oil on the exhaust manifold. I can test the ECU i got at home and see if that fixes my turning off issue. if so i can sell you an ecu for a lot cheaper than whats they go for online. hold off on the ignition switch. Amazingly enough, the ignition thing fixed itself. Now i'm stuck with the same problem. I've replace the TPS and Coolant sensors yesterday and had my car running great, (after turning the Cam sensor to where the engine revved up smoothly even to 7000 rpms.) and went to start it today only to find the original problem where it won't rev up past 3k rpms and when I press down the gas pedal it just dies. I frantically moved the cam sensor for about an hour to no avail. although when I unlug the MAF sensor it does seem to run better, though it won't rev passed 2500 rpms. Should I buy a new MAF??? what happens to your car when you start it with the MAF unplugged? Also when you floor it it revs to about 1200 rpm and it backfires air into the air filter box? Thats weird... So any Ideas?